Can digitizing the food manufacturing industry help boost living standards? The short answer is yes, if we link food manufacturing into the Internet of Goods. We’re used to thinking of food as cheap and getting cheaper. In 1947, spending on food – both in and out of the home – accounted for 27% of non-health personal spending. By 2000, the food budget share, omitting healthcare, had dropped to 14%. This 50-year decline in the food budget share fueled American prosperity. With much less of their budgets going to food, middle-class households could afford to spend more on housing, cars, vacations, and all the other aspects of a good life. But as Figure 1 shows, around 2000, something changed. The decline in the food budget share stopped. Indeed, household spending on food has inched up to close to 15% of non-health personal spending by 2017. 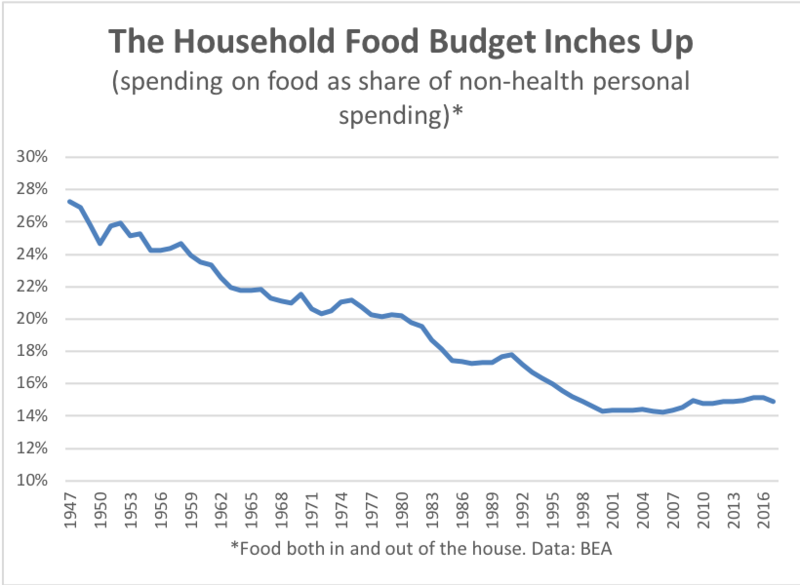 To put it another way, if the past trends had continued, the food share of non-health spending would be only 10%. Americans would have almost $500 billion more to spend in other areas. What happened to the food industry? Groups such as the American Antitrust Institute point to consolidation in industries such as meat processing, which potentially has increased the market power of major players and their ability to raise prices. Another factor boosting food costs may be greater attention to safety. In particular the Food Safety Modernization Act (FSMA) was signed into law by President Barack Obama on January 4, 2011. 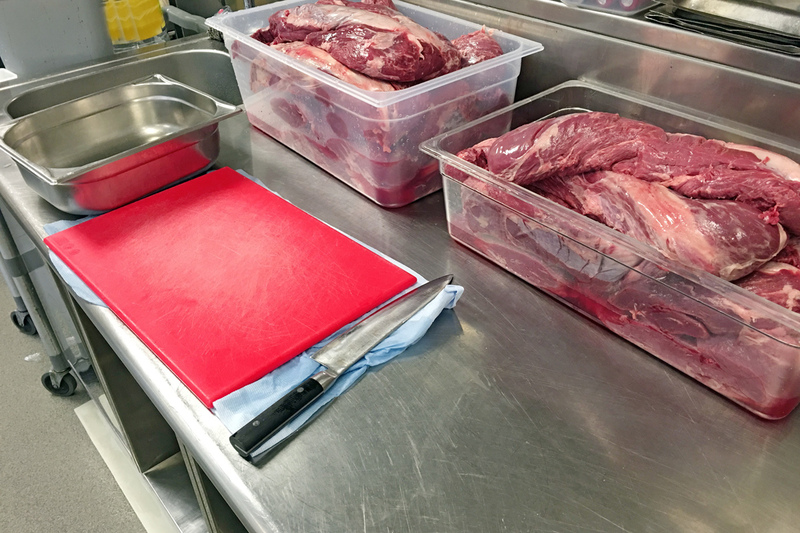 This legislation gives the FDA a new mandate to regulate food production and processing. Indeed, the necessary rules are still being implemented – for example, the FDA is currently asking for comments on a proposed guidance for “Standards for the Growing, Harvesting, Packing, and Holding of Produce for Human Consumption.” Obviously an important step given the current lettuce issue! 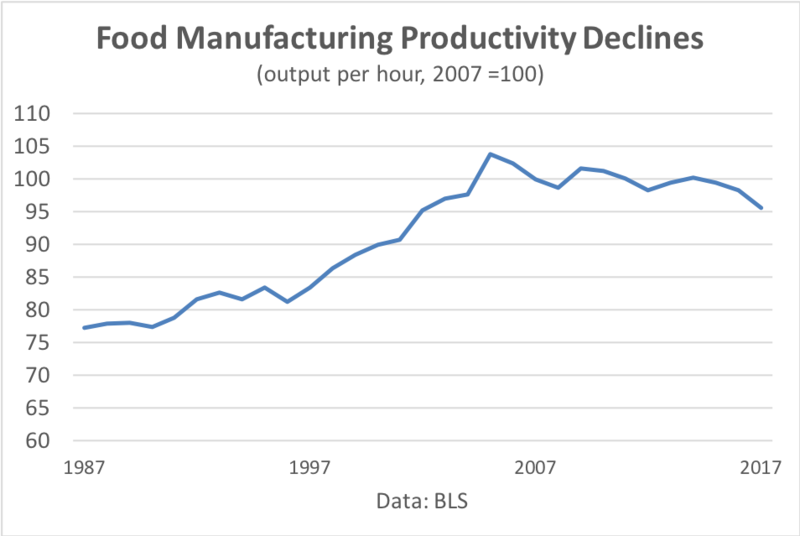 But perhaps most important, the food manufacturing industry has been in a deep and profound productivity slump in recent years. Measured by the Bureau of Labor Statistics (BLS), output per hour in food manufacturing has dropped by 8% since its peak in 2005 (Figure 2). In response, the food manufacturing industry has been embracing digitization, but it’s a slow process. According to data from the BLS, the entire food manufacturing industry employed less than 1000 software developers and programmers as of May 2017, compared to 25,000 engineers and scientists. Digitization will have a significant impact in several different areas of food manufacturing. First, it will become much easier to consistently track food from “farm to fork.” As a result, food recalls will become easier and cheaper. (According to one count, there were 456 food recalls in 2017). Second, digitization of the production process will help boost productivity and lower costs. This includes product development. For example, FlavorWiki is a startup that uses data analytics to quantify consumer taste perceptions, and potentially help companies develop new products. 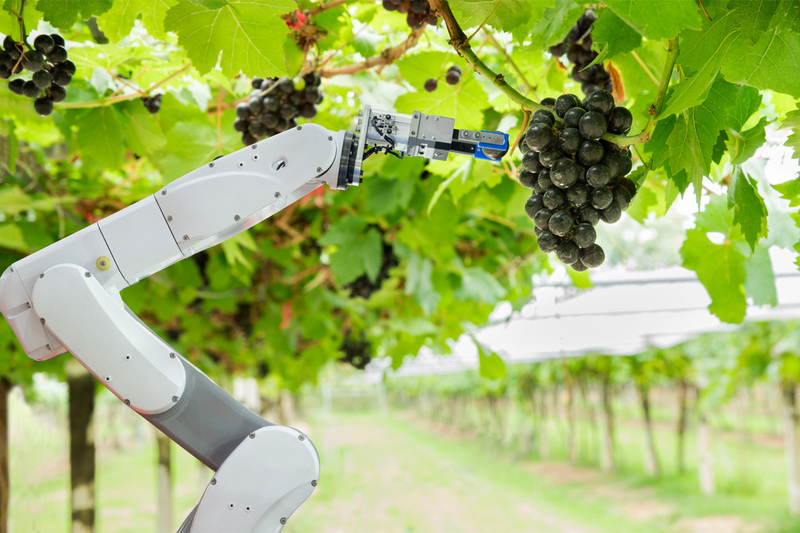 Finally, and perhaps the most important, digitization allows the development of local production models for food, requiring food to be shipped much shorter distances. In Japan, for example, the world’s largest automated leaf-vegetable factory has just opened in a suburb of Kyoto. In the U.S., companies such as Iron Ox are developed autonomous and hydroponic production models. Such vertical farms might be tied directly into ecommerce networks to handle local delivery direct to consumers, thus cutting out several layers of the distribution chain. The result would be lower prices, higher quality, and less pollution from shipping, These are some of the benefits of the Internet of Goods. 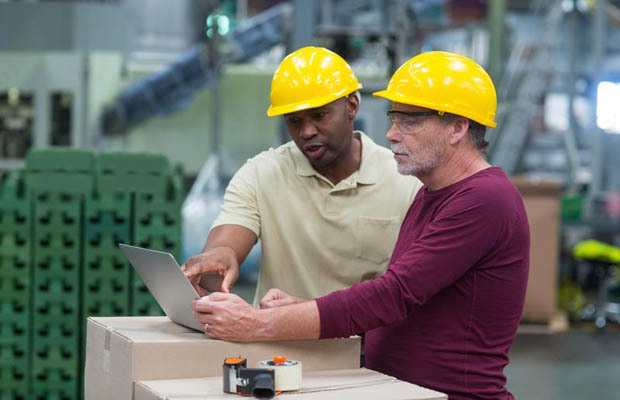 Indeed, digitization will enable the rethinking of the entire food production, manufacturing, and distribution chain, to the benefits of consumers. With any luck, Americans will once again find their food budget shares falling and their standard of living rising.